There’s something really fun about eating a wild plant that, when uncooked, causes burning poison ivy like pain. But for you adventurous eaters out there, when cooked properly, this plant is not only nutritious but delicious! The leaves have a mild flavor that is like spinach – only better! These are true delicacies and you will be hard pressed to find them anywhere other than local farmers markets (unless you forage for them yourself, which I don’t recommend). Word to the wise, make sure you always handle raw nettles with gloves. The tiny stinging hairs will hurt and cause redness. 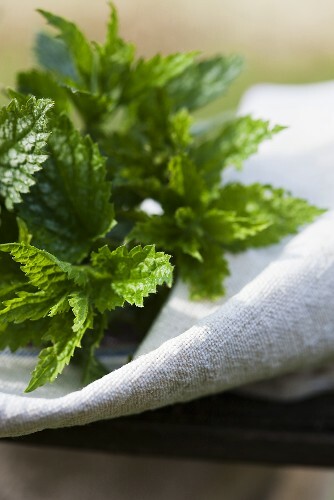 When at the market look nettles that are vibrant green and firm. Avoid those that look brown, yellow or wilted. Always handle raw nettles with gloves! Rinse them well and remove the stems. You can leave the leaves whole, chopped or chiffonade. If you’re still with me and haven’t been scared off, you can cook these guys as you would any leafy green. You can blanch, steam, or sauté and add to a variety of meals like pastas, grains, frittatas, risottos or simply as an accompaniment to a hearty protein. Saute with shallots, butter and some red pepper and serve alongside grilled filet or chicken breast. Add sautéed nettles to risotto with leeks and english peas. Throw into a hearty brunch frittata with bell peppers, onions and mushrooms. Make a pesto with nettles, spinach and ramps. Try substituting the pine nuts for walnuts. Okay, so living in small spaces not many of us have a grill, but any of these items can be made on a grill pan for the same effect. If you’re lucky enough to make a meal on a gas or charcoal grill this summer, give one of these surprising foods a try. I promise you’ll never reserve the grill for only red meat and chicken again! Cheese – Choose a dense cheese or one with a strong rind like, Halloumi, queso fresco or Brie (with the rind on). Brush each side with a little canola or olive oil and grill over medium-low heat until grill marks appear. Serve with fruit or tomatoes as an appetizer or an unexpected dessert. 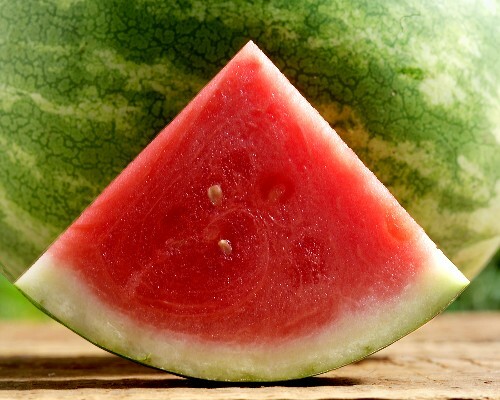 Melon – Watermelon, cantaloupe, or honeydew make great grill mates. The heat from the grill caramelizes the sugar giving the melon a wonderful smoky flavor. Try eating with fresh prosciutto and mozzarella cheese for a riff on a classic appetizer. 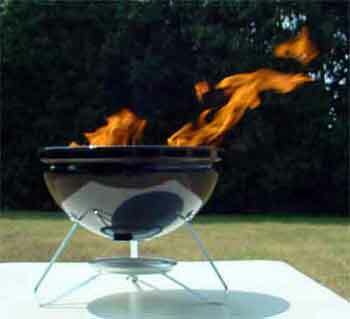 Shellfish – Throw some oysters or clams in a grill basket and put directly on the grate over high heat. Cover and cook for 4-5 minutes until the shells open. Serve with fresh squeezed lemon juice, cocktail sauce or mignonette. You could even toss the bivalves in some pasta with garlic and olive oil for a simple weeknight meal. Pizza- Roll pizza dough out and brush one side with canola oil or a hearty olive oil. 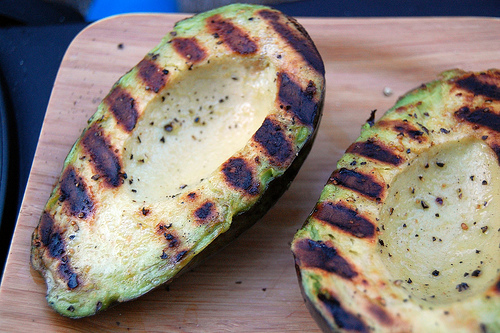 Place directly on the grate and cook for 2-3 minutes until grill marks form. Brush the uncooked side with more oil and flip, cook for another minute or so. Put your toppings on. Cover the grill and cook for another 10 minutes until the toppings are done and dough is crispy. Avocado – Cut in half, remove pit and skin. Brush with canola oil or a hearty olive oil and season with salt and pepper. Place on grill over medium-high heat. The result is a creamy, rich flavor that really brings out the best in the avocado. Serve as is or add to guacamole or salad for a smokey twist. Pineapples, Peaches, Nectarines – Cut in half, remove pit and brush with canola or hearty olive oil. Grill over medium-high heat. Like the melon, the result is a beautiful caramelized version of the fruit. Serve as dessert with ice cream or whipped cream. For a savory twist, cut and use in a fruit salsa or relish. Romaine Lettuce – Wash and dry well. Brush with olive oil and place directly on the grill grates over medium heat until the lettuce begins to wilt. Serve as a side dish to chicken, lamb or beef or as a warm salad with a vinaigrette. 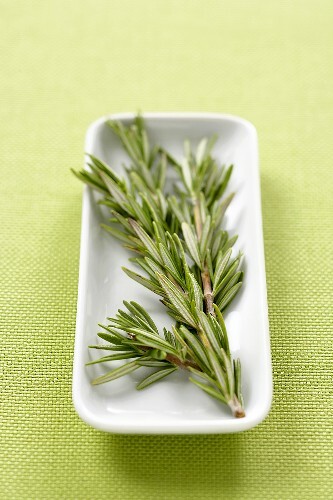 Herbs – Throw a sprig of rosemary or thyme on the grill for 30 second to a minute just to heat and release oils. Add to marinades or even cocktails. Cake – Choose a dense cake like pound cake. Brush both sides with melted butter and put directly on the grill over medium heat. Cook just until grill marks for. Serve as dessert with chocolate sauce, fruit or ice cream. Citrus Fruit– Cut lemon, lime, orange or grapefruit in half and place directly on the grill. Cook until grill marks form and serve as a garnish for fish or chicken. If all this grill talk is making you long for more than a grill pan, check out this nifty indoor grill. Dusty red with hints of green, rhubarb has a wonderfully unique tart flavor that can add a spark to any springtime dessert and some savory dishes. The key to working with rhubarb is balancing the tartness with the right amount of sugar. In some regions of the country it is actually referred to as “pieplant” because it’s frequently used in pies as well as compotes, sauces and crumbles. The long edible, celery-looking stalks should be firm and unblemished. Look for the smaller stalks. Smaller ones tend to be more tender while larger stalks are often stringy and tough. When you get the rhubarb home, wrap them tightly in a plastic bag and pop in the refrigerator. They will stay crisp for up to five days. Trim off any green leaves that may still be attached. These are poisonous! Cut the tough root off and peel back any fibrous layers. Proceed just as you would with celery, cut into slices or small dice, depending on what the recipe calls for. Rhubarb is most commonly boiled with liquid, sugar, honey and other spices or flavorings. You can also bake rhubarb by adding it to cake, muffin or cupcake batter just as you would strawberries, apples or blueberries. No matter how you use it, it’s important to balance the tartness of rhubarb with sugar. Rhubarb also releases a tremendous amount of liquid when you cook it. This is great if you are making a compote or sauce, but for pie fillings or crumbles you will need to use a thickener like arrowroot or cornstarch. Although it might be surprising, you can use rhubarb in savory dishes. Onion, garlic, cumin, mustard and balsamic vinegar all accent rhubarb nicely. But don’t forget to add a little sugar or honey – even in savory preparations! You can pair a rhubarb compete or relish with chicken, pork or even lamb. Create a sweet compote by boiling strawberry and rhubarb together with vanilla bean and cardamom. Serve over whipped cream or ice cream. Add to muffins with a little cinnamon for a breakfast treat. 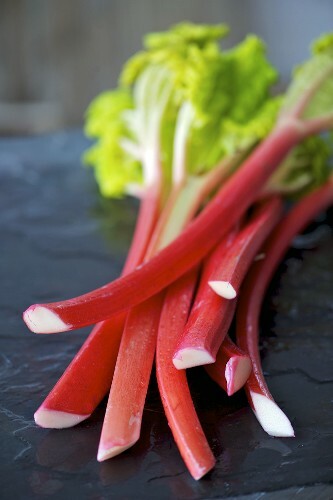 Mix sliced rhubarb with red wine, sugar, cinnamon and cloves and boil. Use as a compote to serve over angel food cake or pound cake. Combine with apple in a chutney and serve with sausages or pork tenderloin. While rhubarb is often used as a fruit it is in fact a vegetable! Who knew? Forget buying flavored vodka off the shelf. Get creative and make your own vodka infusions! It’s easy, budget-friendly and makes great cocktails or as ice-cold shots for a dinner toast! Here are some combination I like, but anything goes, try some of your own. Start with 4 cups of premium vodka. Raspberry-Orange 12 ounces (3/4 pound) crushed raspberries; 12 ounces (3/4 pound) oranges, unpeeled and sliced. Cucumber-Mint 16 ounces (1 pound) cucumber, sliced; 12-15 mint leaves. Lemongrass-Grapefruit 2 stalks lemongrass, crushed; 12 ounces (3/4 pound) ruby-red grapefruit, unpeeled and sliced. Pepper Medley 1 serrano pepper, stemmed and sliced; 1/2 jalapeno pepper, stemmed and sliced; 1/4 habanero pepper, stemmed and sliced. Combine the flavorings and vodka in a jar or empty vodka bottle. Close the container tightly and let stand at room temperature for 1-2 weeks. The more mild combinations like Cucumber-Mint will need a little more time than the powerful Pepper Medley. Strain the vodka and discard any solids. If there are any small solids left in the vodka strain again through a coffee filter. Store in the refrigerator in an air-tight container. 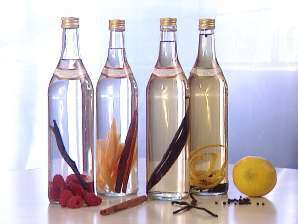 The infused vodka will last for up to three months. 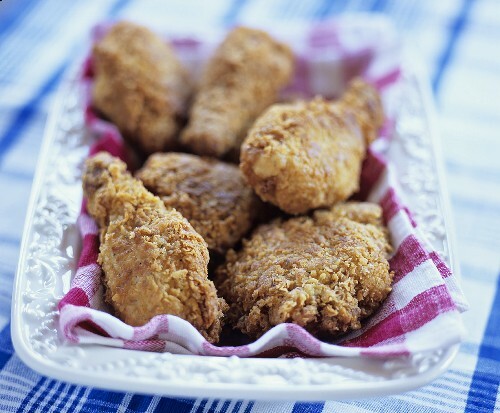 There’s nothing like some fried chicken on warm summer day! This is the perfect picnic food. It’s easy to eat and filling without being fussy. And cooking in the oven instead of oil cuts down on calories, who doesn’t like that? In large bowl, combine buttermilk and garlic. Let this sit for 30 minutes. Preheat to 400°F. Place a rack in a roasting pan or baking sheet. Pat the chicken dry with paper towel. Set aside. In large bowl, combine breadcrumbs, cayenne pepper, paprika, salt, and pepper; toss well to blend. Pour the flour in another bowl. Line up the flour, buttermilk mixture and breadcrumbs. Dredge the chicken in the flour and coat thoroughly in buttermilk mixture. Tap off any excess liquid and roll chicken in breadcrumbs. Place the chicken on prepared rack. Continue with all the chicken. Spray each piece of chicken with cooking spray. Bake chicken until golden and cooked through, 35 to 45 minutes. Transfer to wire rack to cool. Quick Tip: Make the chicken the day before, let it cool and refrigerate overnight. When you’re ready to leave, pack the chicken in a plastic container lined with parchment paper. 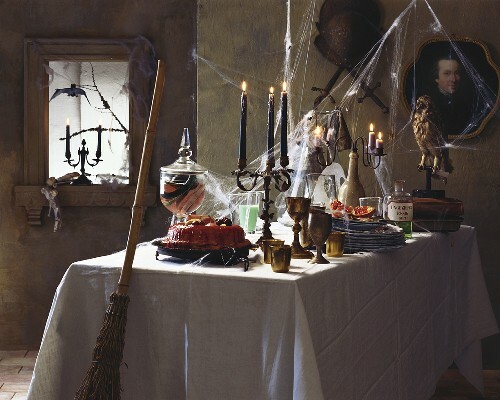 This recipe was first published in the March 1994 issue of Gourmet Magazine. The dough produces the best, crunchy cookies. There’s no way you’ll only eat one! In a bowl whisk together flour, baking soda, baking powder, salt, and oats. In another bowl with an electric mixer cream butter and sugars until light and fluffy. Beat in eggs, 1 at a time, beating well after each addition, and beat in vanilla. Beat in flour mixture and stir in chocolate chips. 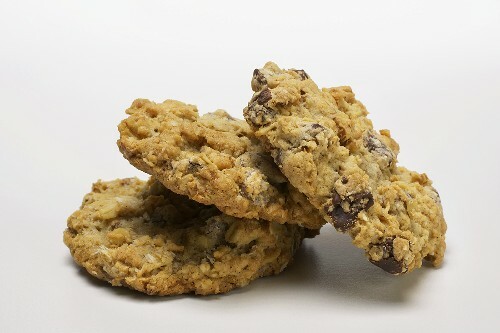 Drop dough by rounded tablespoons 2 inches apart onto buttered baking sheets and bake cookies in batches in middle of oven 12 to 15 minutes, or until golden. Cool cookies on racks. Cookies keep in airtight containers 5 days. Lay flour tortilla flat on a clean surface. Spread 2 tablespoons of mayonnaise over the tortilla. 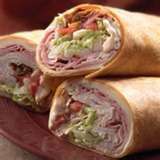 Add chopped lettuce, 4 slices of tomato, 4 slices of bacon, salt and pepper and 4 ounces of turkey to the tortilla. Roll the tortilla up tightly to enclose the fillings. Slice in half. Repeat process to complete the other sandwiches. I love potato salad without mayonnaise. This is a great recipe I adapted from Ina Garten. She serves hers with Grilled Tuna Nicoise. I think it’s good enough to stand on its own or along with fried chicken! Drop potatoes into a large pot of boiling salted water and cook for 20 minutes, until they are just cooked through. Drain in a colander and place a towel over the potatoes to allow them to steam for 10 more minutes. 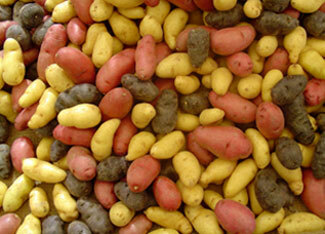 Once they are cool enough to handle, cut in 1/2 (quarters if the potatoes are larger) and place in a medium bowl. Toss gently with the wine and chicken stock. Allow the liquids to soak into the warm potatoes. Create an emulsion by combining the vinegar, mustard, 1/2 teaspoon salt, and 1/4 teaspoon pepper and slowly whisk in the canola oil. Add the vinaigrette to the potatoes. Add the scallions, dill, parsley, basil, 1 1/2 teaspoons kosher salt, and 1/2 teaspoon pepper and toss. Cool and serve at room temperature.